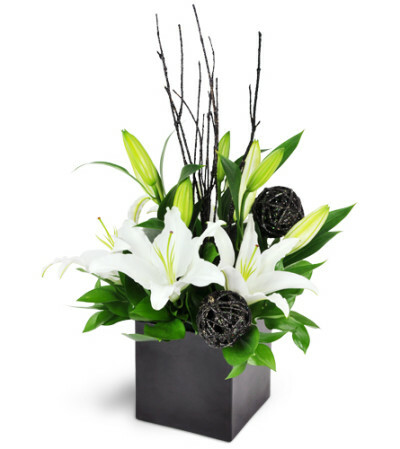 This stunning black and white arrangement is a perfectly modern gesture for any occasion. Contemporary, stylish, and sure to please any fashionista! Creamy white lilies are beautifully highlight by a deep black container and black twig accents. 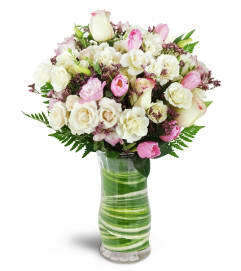 Flowers ordered from the UK for a birthday in CT. Very efficient ordering system on-line. Our daughter got a phone call confirming where the delivery had been left as she was out. Beautiful flower arrangement and Mum spelt the UK way! Well done to all. Thanks. Excellent. Flowers were amazing. Went with the “florists choice” and they did not disappoint. Yes she got the flowers and loves them. Who wouldn't from such a quality florist. 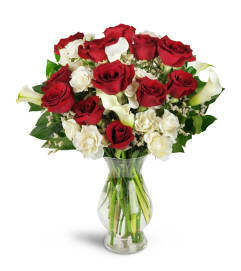 Peter Rogers Florist is a Lovingly Florist in Stamford. Buying local matters. Discover how Lovingly supports local florists. Copyrighted images herein are used with permission by Peter Rogers Florist.